I’m going to say something I thought I’d never say: we should all be listening to Utah. Well, because they have managed to reduce their homelessness rate by seventy-four percent in the past eight years, moving 2000 people off the streets, putting them on the road to “ homelessness altogether by 2015”, that’s why. They are giving away apartments. For nothing. No strings. Utah calculated the costs between giving apartments away and providing a social worker to each person, compared to the average annual cost for a homeless person’s E.R. and jail visits, and found that the apartment/social worker route cost them over $5,500 less per year to do – $5,670 less, to be precise. The cost of providing an apartment and social worker is only $11,000 per year, per person. Other states, like Wyoming, are starting to follow their example. Compare this to, say, the news coming out of Norway, where they are planning on passing a new law that bans begging. The stated reason is to combat the high rates of pick-pocketing the country’s capital of Oslo sees, but that sounds an awful lot like the foolish band-aiding that Australia is seeing with the pub lockouts in order to prevent alcohol-fuelled violence. Rather than actually address the issue – whether it be homelessness or violence – they slap a band-aid on a symptom and say it’s fixed. On any given night in Australia, there are over 105,000 homeless people sleeping on the streets. That’s one in every two hundred people. Results from the 2011 census showed that the rates of homelessness had increased by 8% from 89,728 to 105,237. I’m not going to talk about the budget here. Yes, the Abbott Government made a pledge (as of March 30th) of $115 million to homelessness services after CEO’s of various companies warned that there could be a wave of lay-offs without some kind of intervention. This is, however, $44 million less than Labor’s last pledge, and although the Prime Minister “reject any suggestion of cuts”, Labor spokeswoman Jenny Macklin sees it a different way. “There’s less money to be spent on building homes for people who don’t have them, for women and children escaping violence, for people who are living on the street,” she said. There is so much that needs to be done and that could be done. According to Homelessness Australia, we should very much be investing and funding early intervention programs, rather than treating them “like pilot programs”. We need to fund more homes. We need to encourage our States to look after the homeless. Or, you can go what seems the complete opposite way and look to places like England and Canada where authorities are putting down “anti-homeless spikes” in certain areas to prevent the homeless from having a place to sleep. This absolutely astonished me – is this how low we have sunk? I always loved that places like Montreal would make sure all the metro stations stayed open 24/7 in winter so the homeless would have a warm place to sleep. Sure, it’s another band-aid, but at least it isn’t actively hindering people. It’s a nice gesture. It’s something. So, why are they doing this? Some protesters in London poured concrete over the spikes in order to make a point, and earlier this month some spikes were removed from outside a Montreal bookstore. A petition was signed by over 130,000 people and the spikes were removed from London and Montreal. The problem is well laid out by Matthew Pearce of the Montreal Gazette: Now what? Sure, the spikes have been removed, but now “the issue is fading from public discourse”. Spikes aren’t the only “weapon” being used via city design to drive the homeless away. All you have to do is look at benches in outdoor places nowadays: separated by armrests so you can’t lie across them; designed in peculiar shapes not designed to be lain upon; lumps of metal on the curb side to be “skateboard deterrents”; there are so many. There are so many things we do to prevent the homeless from being an issue we can see, an issue that must be recognised because it is right in front of us. 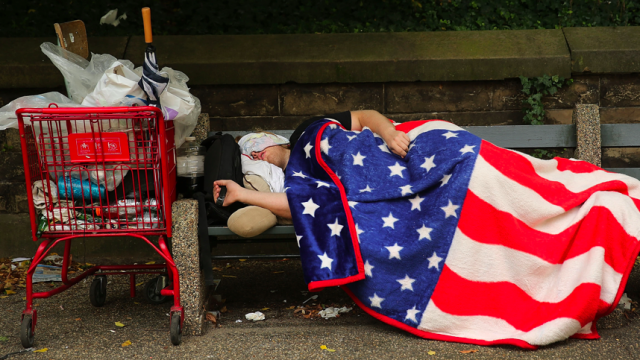 We need to start addressing the graver issue that underlies homelessness, whatever those may be – for they are many and various – and start helping these people. So, come on, let Utah be our guide. Are we helpless when it comes to the homeless? Great article!! Thank you… this is so ironic given that Tony Abbott was formerly the patron of Streetwork, a not for profit dealing with at-risk youth on the North Shore. He knows that this mentoring program resulted in 85% of the people they engaged seeing their lives greatly improved, and also reduced the homelessness in the remaining 15%. He seems to be playing an ignorance card that he is just not entitled to use.